West Anglia Route Improvement – What Is STAR? STAR stands for Stratford-Tottenham-Angel Road and is a proposed four trains per hour (tph) service between Stratford and Angel Road stations, calling at the following stations. The main purpose is to provide a service to the new £3.5billion housing and commercial development project at Meridian Water, the developers of which will be rebuilding Angel Road station and renaming it to Meridian Water. Brief details of the project are given in the March 2017 Edition of Modern Railways. STAR will help in the four-tracking of the West Anglia Main Line. More will certainly emerge in the next few months. But I have a few questions about STAR. Will STAR Services Go Beyond Angel Road Station? The only STAR service at present is the two tph service to either ?Hertford East or Bishops Stortford stations that call at Lea Bridge, then in a rather haphazard pattern up the Lea Valley. It is not a passenger-friendly service, as you turn up for the half-hourly train and find the destination you want is served on the alternate service. I have a feeling the service pattern is designed by history, rather than a train planner with a brain. What Type Of Train Will Be Used? I think the route STAR will take, has a possible headroom problem at Tottenham Hale. When I first saw this bridge and saw the height of the overhead electrification on the existing West Anglia Main Line under the far span, I immediately questioned if they could fit the electrification under either of the blue steel bridges, where STAR might pass, in a manner that would meet all the Health and Safety regulations. Read this article on the Rail Engineer web site, which is entitled EGIP – electrification clearance woes, to learn more about how regulations are making electrification not just an engineering problem. So will this mean that STAR will be built without wires? Diesel trains would work, but wouldn’t fit the profile of Meridian Water as an ecologically-sound development. I think we could see IPEMUs or electric multiple units with onboard energy storage working the route. Will STAR Share Platforms With The West Anglia Up Line? 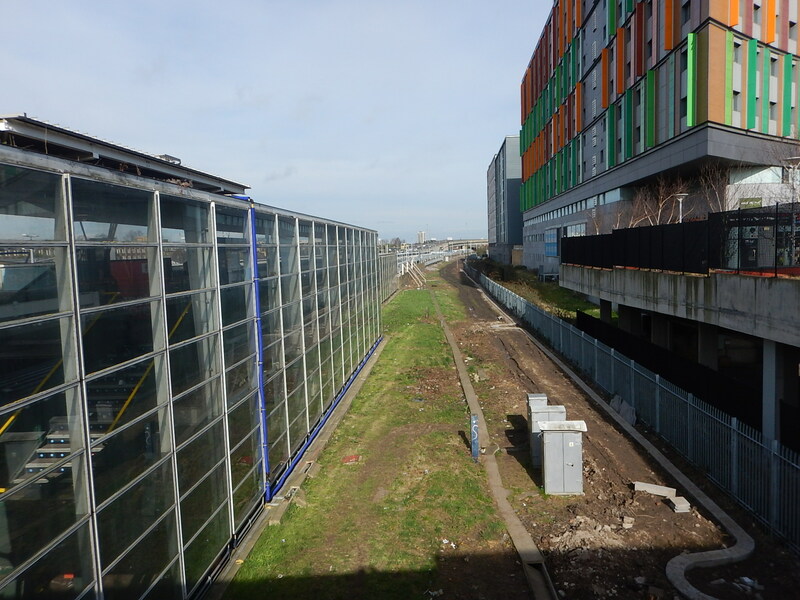 The space for putting the third track for STAR is narrow as this picture at Tottenham Hale shows. If STAR goes through in the space conveniently marked by green grass, the easiest way to create a platform would be to add a second face on the existing Platform 1. 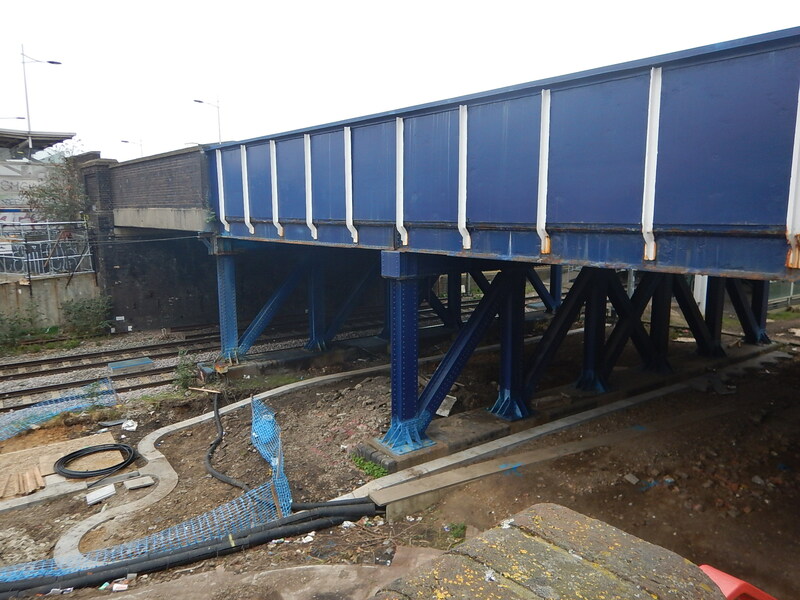 A step-free bridge is being built linking Hale Village to a new station building with step-free access to the existing Platforms 1 and 2. If STAR used the other face of Platform 1, it would share the step-free access of that platform. STAR would have cross-platform access with services to Liverpool Street. There would be step-free access between STAR and the Victoria Line. It could be a very simple and affordable way of creating a new platform and interchange with full step-free access. The technique could also be used at Northumberland Park station. Could STAR Call At Stratford International Station? One of the many proposals for the Docklands Light Railway was to extend the Stratford International Branch along the Lea Valley. This seems to have been dropped. But there is a line called the High Meads Loop, that would appear to allow trains to call at Lea Bridge station and Platform 11 at Stratford station, before looping round Eastfield and Stratford International station and returning through Lea Bridge station. In a forum, a claim is made by I assume a driver, that he’s done this. If a platform could be built on the High Meads Loop to serve Stratford International station, then STAR services could go round the High Meads Loop and call at the platform. But if the loop could be used to turnback trains, then it would allow a lot more trains to use Stratford as a destination. Could A Similar Service To STAR Connect Stratford To Walthamstow And Chingford? I have been past the work-site between Lea Bridge station and Coppermill Junction several times in the last few days and it would appear that the Hall Farm Curve that would make this service possible is being cleared of fifty-plus years of rubbish. But, there are other problems in creating this service, like the level crossing at Highams Park station. Could The Capacity Of STAR Be Increased? The capacity on the East London Line, which runs a similar 4 tph service on four separate routes, was increased by the simple process of lengthening the trains. Provided the platforms are built to accept longer trains, this would be the easy way to increase capacity. What Will Happen To STAR When The Great Anglia Main Line Is Four-Tracked? STAR will only affect the West Anglia Main Line between Coppermill Junction and Angel Eoad, as this is the only section, where the STAR and the new lines will co-exist. In How Many Fast Services Will Go Through Tottenham Hale Station?, I concluded that there will be between ten and twelve fast trains per hour in both directions between Tottenham Hale and Broxbourne stations. I also think, that these trains will go non-stop along the new lines only stopping at Broxbourne, as the timings of the new slow trains could be the same as the current fast ones. See Timings Between Tottenham Hale And Broxbourne Stations for full details. As the four-tracking will not take place for a few years, I think it is likely that Stadler and Bombardier will be able to fit onboard storage to their trains, so could we see the two new lines squeezed into the small space between STAR and the development at Tottenham Hale without electrification? Signalling technology would also probably allow such a line to be bi-directional, with trains running alternatively in both directions. It would certainly save space to have a single bi-directional line without electrification handling the fast trains through Tottenham Hale! The fast line would revert to a normal double track at Coppermill Junction and Angel Road station. As closing a rail route is often a difficult process, even after Crossrail 2 is providing a high frquency service between Tottenham Hale and Angel Road, STAR will continue into the future. STAR is putting down some interesting markers for the future.